Two more acts have bit the dust. It's been two weeks since the last post and I'm sorry for not writing one last episode. To recap last week: Diamond White returned for the teens and Jason Brock was eliminated from the Over 25s. I expected him to be the one leaving so it wasn't a sad week. The episodes have already aired and two competitors were sent packing. 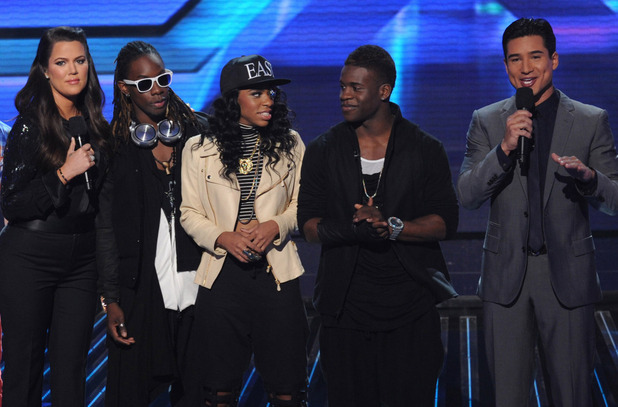 First, hip hop group Lyric 145 was eliminated early in the episode based on viewer votes and then 18 year old Jennel Garcia by a judges' vote of 3-1. Let me just say: this week was shocking! I went in thinking these two acts would survive but when I heard Lyric 145's name, I completely threw out any predictions. Since the week is over, I'll share my thoughts about the singers. I had originally guessed Arin would be in the bottom (and he was close). Revealing the rankings helped to garner him more voters but based on his last performance, eventually he will be eliminated. I don't foresee him lasting long in the competition, maybe even being in the bottom next episode. She's lucky for getting invited back - not many people get the opportunity. Her performance was good and even with slipping in the rankings, she'll do well next week and in the next few rounds. Beatrice has a lot to prove. Same as Arin, revealing the rankings helped her move up but she's still in the bottom half. Unless she stands out more, either her or Arin (maybe both) could be in the bottom. Carly has earned second place two weeks in a row. Her songs are getting better and better, with no complaints. Her only challenge is trying to take the top spot and by the looks of it, she's on a one-way express trip to the finals. Paige's performance wasn't great but I didn't expect her in the bottom. This may be due to the surprise rise of several weaker contestants from last week. Her vocals need some work and she could be in danger unless things turn around. Oh Jennel, it's sad to see you go. Not many thought she would be in the bottom. She changed so much since her first performance and it definitely worked against her in the end. Biggest surprise of the night! Cece didn't just survive the low vote elimination but she earned the fifth highest spot overall. It's no secret she's one of the few I'm rooting for and that it's obvious her rise impacted her team's standings. I don't know how far the voting campaign will help but her fans got her into the Top 10 (which is a hard task in singing shows). Fine... I'll say it: sorry Vino. I misjudged and thought he would be going home first, but his fans apparently really love him enough to place him in the third spot for two weeks in a row. He's still not one of my favourites and I'm not quite sure if he could pull a win at this time. First place for two weeks in a row. Being the only country music artist left in the show is really helping him secure votes and keep the top spot. Eventually he may slip one week and lose the top spot. However, so far it's looking like a sure bet he will be in the finals. Did not expect this sudden elimination at all. Sure, their mash-up was terrible - the song choices made no sense. Though, I assumed they'd have enough votes to land for the judges' vote. They're the only pre-Top 10 act that could find some success post-show. This X Factor created group is starting to find its place. They're still one of the buzzed about performers and could make it farther down the line. However, I want to see more from their performances and for them to stand out to earn a top spot. Simon is putting a lot of bank in this group. He pushed voters to vote and they got into the top fourth spot. These guys won't be eliminated anytime soon but there will come a point where they could land in the bottom. Though, they're fan favourites and could make a splash. What did you think of the double eliminations? Post in the comments below and let me know about which performer you think will end up in the bottom next episode.